Mark Russinovich’s ‘Zero Day’ – Fiction Or Fact? Muslim jihadist, undetectable rootkits, replicating viruses with cloaking capabilities, inept politically motivated government departments, security application vendors driven by their own needs – all accelerating toward a nexus where economic destruction, and personal calamity, show every sign of being unavoidable. ….. and one man, with bulldog determination, who struggles to change the course of the seemingly inevitable. An improbable scenario? Hardly! As an Internet Security professional, I recognize the ingredients in this recipe for disaster, only too well. Mark Russinovich, in his first solo effort, has crafted a bombshell tale of fiction in his just released novel – Zero Day; ripped out of the mishmash of disorganized chaos, and conflicting objectives, that passes for system and Internet security. Russinovich, well known to those of us in the Internet Security community, as well as techies and high level computer users, as the mastermind behind Sysinternals, knows his stuff. In Zero Day, Russinovich takes us on a skillfully crafted journey which relies on accuracy – no exaggerations – perhaps even understated; which is, at it’s core, frightening in it’s revelations. The fact that the novel is fiction, doesn’t change the underlying reality – our reliance on the Internet has led us into a state where economic and personal mayhem may be just around the next corner. 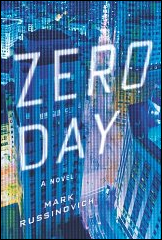 As an avid reader who chows down on eight or more books a month, I could hardly wait to get my hands on Zero Day following an invitation to critique. I was not disappointed. Zero Day is event driven, and relies on a fast pace rather than character development to capture the readers imagination. A great read – entertaining, and at the same time, sure to bring into question the continuing viability of the Internet as we know it. For more information visit: Zero Day – The Book. Mark Russinovich is a leading expert on cyber-security and a Technical Fellow at Microsoft, Microsoft’s highest technical title. Thanks for the review, Bill! Thanks for the great read. Looking forward to more of Jeff’s adventures. Happy Easter to you and your family . Thank you Murphy – the same to you, and your family. A perfect illustration as to why one must use dot com, in a web address. My fault – it’s now corrected. You’ll enjoy this book. I won’t spoil the plot but, it’s nicely structured, as it plows through diagnostic techniques in a malware search and destroy operation, complicated by the usual human foibles. Muslim Jihadists create a highly effective image and so, can be used effectively to illustrate, at a fictional level (at any level, in fact), a powerful characterization of the perils we face. I’m familiar with this article and, I quite agree with your assessment. We would be negligent, it seems to me, if we dismissed “legitimate” (open to much interpretation), purveyors of cyber warfare as a threat, by creating illusions as to their motivation. The “good guys” are not always the good guys. Thank you for both the comment, and the link. Looks like a great read, I’ve admired his work for years on Sysinternals, I’m going to buy it today! You’re gonna love this book! Thanks for the tip on Steve’s Podcast.